20 lovely designs of unique mothers and grandmothers rings crafted in Canada. 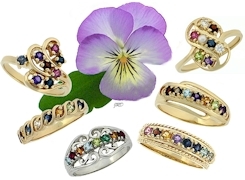 Each ring can be set with from 3 to 8 birth month stones. Choose from 10k or 14k yellow or white gold with genuine or simulated stones. Click here to view selection. 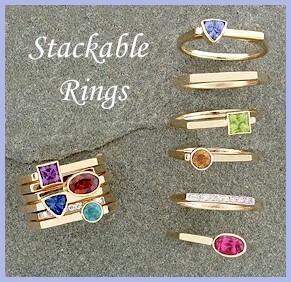 Our newest stacking rings and pendants are available in sterling silver or 14k yellow or white gold. 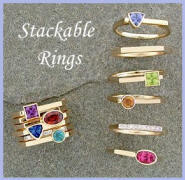 Each ring or pendant is set with a birth month stone to represent those important to your life. Genuine or Chatham® Created (man-made) stones are offered. Click here to view selection. Lovely designs that are set with stones to represent your unique family or special occasion. Optional laser engraving makes these items memorable keepsakes. Select 10k or 14k, yellow or white gold with genuine or simulated stones. Generally ships in about 2-3 weeks! 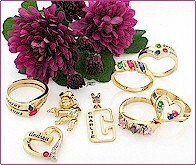 Rings, pendants and bracelets. Click here to view selection. 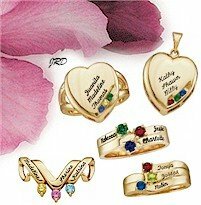 This is our newest collection of name personalized mothers and family jewelry. Ships in about 7-10 days... that's fast for a personalized and custom set item! Choose from rings or pendants in 10k or 14k, yellow or white gold. Stone set items are available with simulated or genuine stones. Click here to view selection.